Clonoulty was the venue for the county road relays that started off the road season on Sunday last. Thankfully, it was a dry day, with a cold wind that reminded everyone that winter is still well and truly with us! We had 12 athletes competing for the club comprising of two ladies teams and one men’s team. First out, at noon, were the ladies. We were fortunate to have 2 teams competing for the club – one in the ‘A’ and the second team in the ‘B’ competition with all teams starting together. Brigid Gleeson ran the first 800m leg that began on the road and saw the athletes sprinting into the GAA grounds. Her strong finish helped Sharon Cantwell to keep their good position in the 1,500m leg of the relay. Next was Emma Gleeson who ran a very convincing 800m leg, where she gained great ground for the team. Angela Fogarty completed the final leg of the relay, which was a challenging 3,000m. It was a close battle for 2nd and 3rd position but Angela pulled away in her final 800m to clinch the bronze team medal in the ‘A’ category. In the ‘B’ category, Susan Fogarty, who thankfully stepped in at the last minute, ran the first 800m leg, coming in hot on Brigid’s heels. Edel Delaney’s consistent pace in the 1,500m leg kept the team well in contention. Ber Spillane set off on the 3rd leg of 800m making great strides to set Siobhan Power up for the 3000m leg. 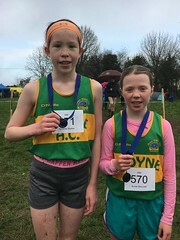 She ran evenly until the last 300m when pressure from the Dundrum athlete threatned and she accelerated away to clinch the bronze team medal. Once the ladies relays were completed, the men’s teams got into position. First out for Moyne AC was Richie Daly who sprinted the 800m down to the second runner on the team, Nathan Bowe. Nathan ran the 1,500m strongly and passed the baton to Brendan Delaney. Brendan, who also stepped into the team at the last minute, ran a convincing 800m leg where Jodie Sweeney completed the last 3,000m leg of the relay, which sees the athletes undertake the hill on the far side of the grounds four times. They finished 6th overall and 3rd in the ‘B’ category. Well done to all the athletes who represented the club proudly and effectively! !